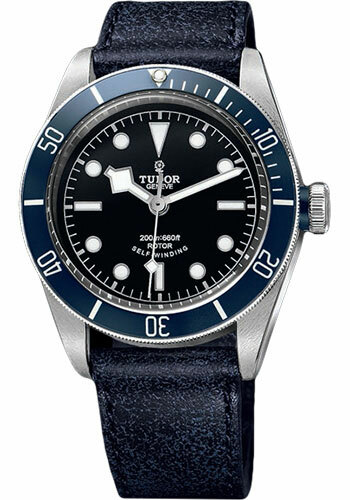 41 mm stainless steel case with polished and satin finish, screw-down crown with blue insert and engraved with the Tudor rose, unidirectional rotatable steel bezel with matte blue disc, domed sapphire crystal, black dial with luminescent hour markers and hands, Tudor caliber 2824 self-winding movement, approximately 38 hours of power reserve, aged blue leather strap. Water resistant to 660 ft (200 m). 41 mm polished and satin finished steel case, screw-down steel crown with black-lacquered and engraved tudor rose, blue anodised aluminium winding crown tube, steel unidirectional rotatable bezel with disc in matt blue anodised aluminium, domed sapphire crystal, domed black dial with grey index, Calibre MT5602 self-winding movement with bidirectional rotor system, approximately 70 hours of power reserve, blue aged leather strap, folding buckle with safety clasp. Water resistant to 200 m (660 ft). 41 mm polished and satin finished steel case, screw-down steel crown with black-lacquered and engraved tudor rose, black anodised aluminium winding crown tube, steel unidirectional rotatable bezel with disc in matt black anodised aluminium, domed sapphire crystal, domed black dial with pink index, Calibre MT5602 self-winding movement with bidirectional rotor system, approximately 70 hours of power reserve, aged black leather strap, folding buckle with safety clasp. Water resistant to 200 m (660 ft). 41 mm polished and satin finished steel case, screw-down steel crown with black-lacquered and engraved tudor rose, burgundy anodised aluminium winding crown tube, steel unidirectional rotatable bezel with disc in matt burgundy anodised aluminium, domed sapphire crystal, domed black dial with pink index, Calibre MT5602 self-winding movement with bidirectional rotor system, approximately 70 hours of power reserve, brown aged leather strap, folding buckle with safety clasp. Water resistant to 200 m (660 ft).